Email has become an indispensable part of modern life, not only to legitimate users but to scam artists as well. 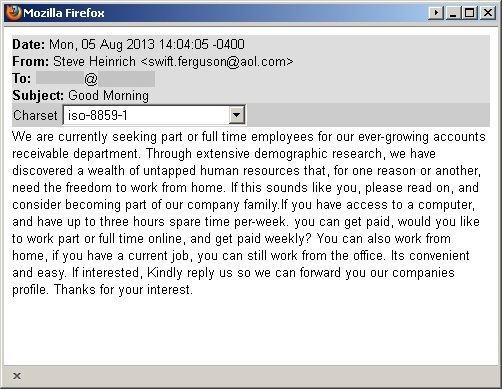 One of the more serious scams that turn up in the Barracuda Labs honeypots is also one of the ones with the least offensive appearance – the fake job offer. 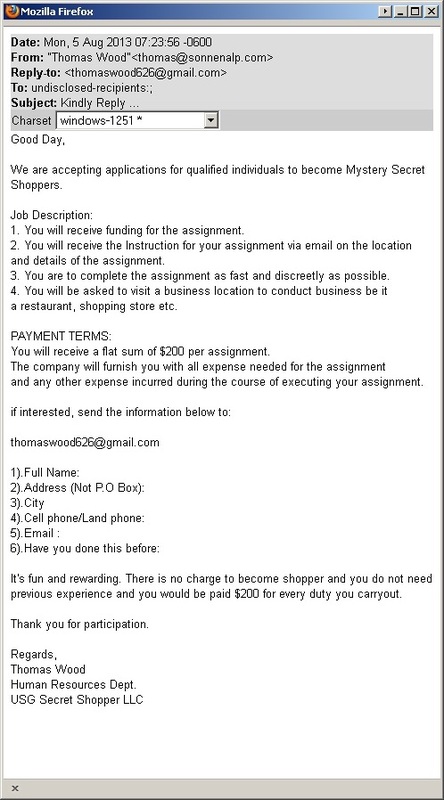 These follow one of two typical approaches, either the personal assistant / accounts receivable position, or the mystery shopper offer. 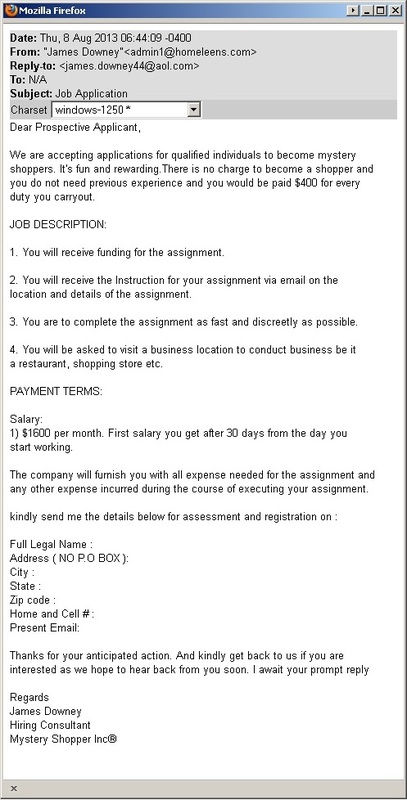 Unfortunately the bland appearance of these scams does not attract the amount of attention as better known ones, such as the Nigerian 419 scam. While most of us instinctively feel that there is something shady going on with these we blithely delete them and move on. That lack of visibility allows these scams to find more victims in their target audience – people out of work and in desperate need of money. 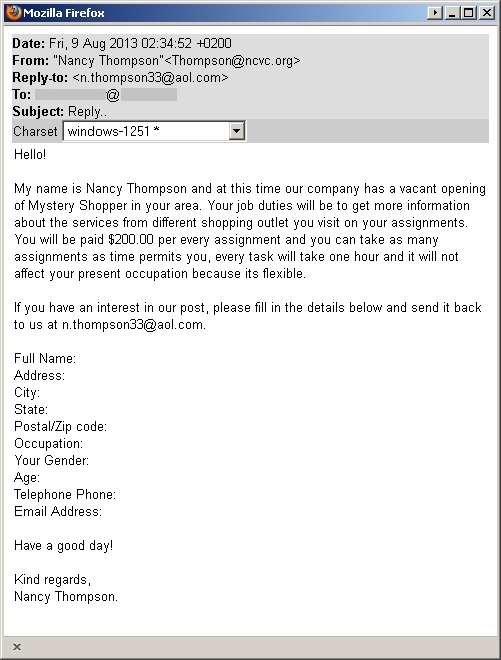 Indeed, while we usually see these spammed out in bulk, they are often sent in a targeted manner to members of jobs boards such as Monster, Dice, and even Craigslist. The scam is simple yet devious. The victim is set up as an 'employee' who will need to forward payments to headquarters, or as a ‘mystery shopper' who will need to evaluate the service of a MoneyGram or Western Union outlet, often at a WalMart. Funds are forwarded in the form of a check, which the victim cashes into their personal bank account. The lions share of the money is to be forwarded overseas using the untraceable services of those two companies. Eventually the check is returned as fraudulent and the victim is on the hook for the money, often thousands of dollars. 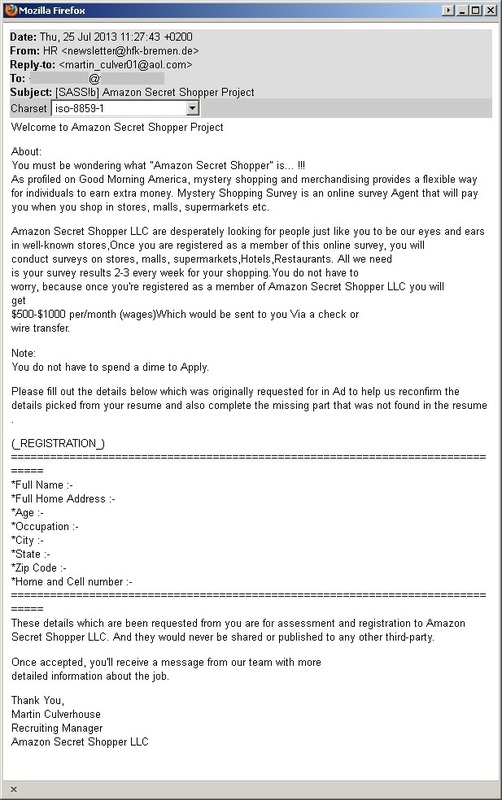 The FTC has a good explanation of the Mystery Shopper angle, and Snopes explains the details of the more general Cashiers Check scam. The personal assistant variation uses the same mechanics but has the appearance of a more traditional job – often victims are interviewed for those positions by phone before being scammed! 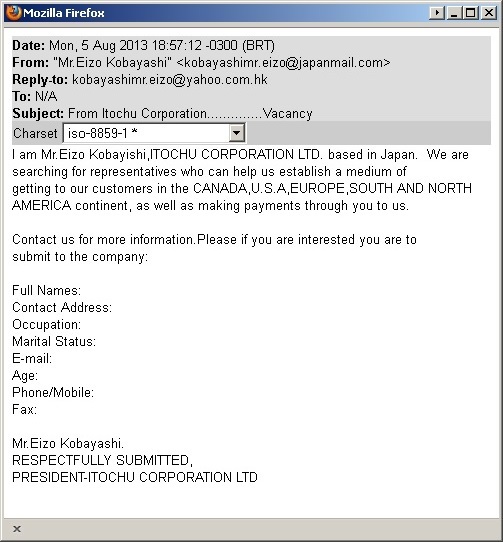 One distinguishing feature of these is the amount of money that is promised in the email. Real mystery shopping services (there are some) pay small potatoes, maybe $20, and never ask you to cash checks for them. The scammers promise plenty of easy regular money, but all they deliver is trouble. The first and most important step in avoiding such scams, and especially in helping friends and family avoid them as well, is to be aware of how they work. To be forewarned is to be forearmed. 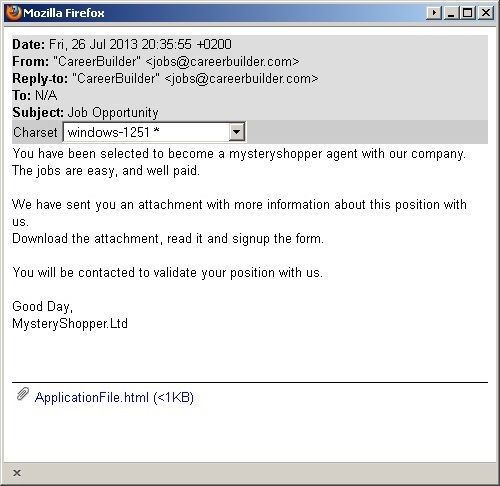 Barracuda customers using the Barracuda Spam & Virus Firewall are protected from these emails.